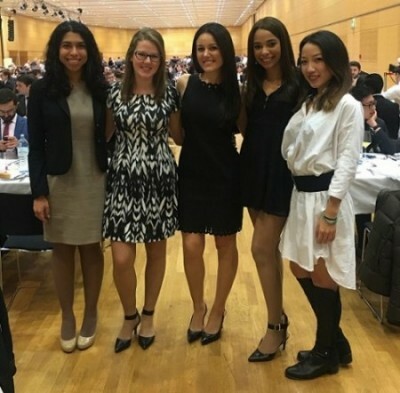 Pace Law School’s Vis Moot Team competed in the 2016 Willem C. Vis International Commercial Arbitration Moot competition this March in Vienna, Austria. The competition was composed of over 300 teams from over 60 countries. The Pace team consisted of Vittoria Fiorenza (3L), Brianne M. Cunningham (3L), Monica Calderon (2L), Angelica Cancel (2L), and Patricia Lam (2L). Pace Law School was mentioned several times during the opening ceremonies of the event as the sponsor and founding university of the Competition. Pace Law Professor Darren Rosenblum spoke at the opening ceremony representing Pace. The team was coached by Pace Professor Linda Wayner and Pace Alum Bryn Goodman. The team competed four times in the general rounds. The team argued against the University of Bielefeld, Federal University of Paraná, the University of Silesia, and Dalian Maritime University. As part of the competition, each team is required to submit two memorandums, one as Claimant and one as Respondent. This year’s team won an honorable mention for their Respondent memorandum. 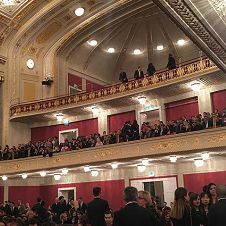 Held in Vienna each Spring, this moot is the world’s premier international commercial law moot court. Founded by Pace Law School, this competition is named for Professor Willem C. Vis, who was a highly respected scholar and former Pace Law School faculty member. The moot involves an arbitration of a contract of sale between two parties in countries that have adopted the United Nations Convention on Contracts for the International Sale of Goods. This moot provides experience in commercial arbitration skills and provides an opportunity for students to develop commercial law expertise. The research for this moot begins in the Fall semester and continues through the Spring, at which time two briefs are due. Selected students within the Vis team travel to Vienna. All team members, regardless of their selection to travel to Vienna, are entitled to earn 2 credits for their participation. Learn more about the Willem C. Vis International Commercial Arbitration Moot via this website. The 2016 Pace Vis team and coaches were proud to represent Pace Law School in Austria. C​ongratulations to Vittoria, Brianne, Monica, Angelica, and Patricia. Next Congratulations to the Pace 2016 National Ethics Trial Competition Team!